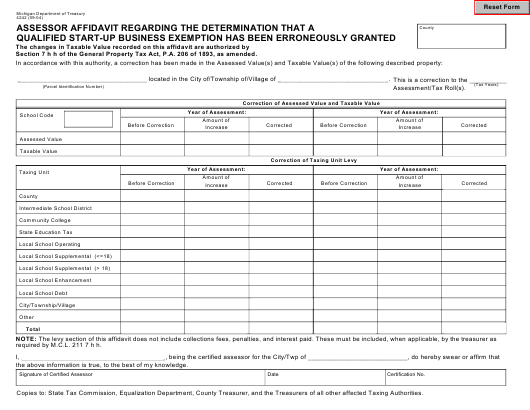 Form 4242 or the "Assessor Affidavit Regarding The Determination That A Qualified Start-up Business Exemption Has Been Erroneously Granted" is a form issued by the Michigan Department of Treasury. Download a fillable PDF version of the Form 4242 down below or find it on the Michigan Department of Treasury Forms website. Section 7 h h of the General Property Tax Act, P.A. 206 of 1893, as amended. ___________________________________ located in the City of/Township of/Village of ______________________________. required by M.C.L. 211 7 h h.
the above information is true, to the best of my knowledge. Copies to: State Tax Commission, Equalization Department, County Treasurer, and the Treasurers of all other affected Taxing Authorities.